Weis Markets, Inc. is a chain of supermarkets based in Sunbury, Pennsylvania, with a presence in Pennsylvania, New York, New Jersey, West Virginia, and Maryland. In 2012, it operates 162 stores in five states. Weis Markets was founded as Weis Pure Foods in 1912 in Sunbury, Pennsylvania by two brothers, Harry and Sigmund Weis. Their store has been noted as “revolutionary”, as it did not operate on credit—sales were only for cash. At the time, similar stores operated on credit, allowing customers to build a tab that would be paid periodically. Cash sales were a sign of a growing working class earning steady paychecks—and they also helped lower prices by up to 25%. 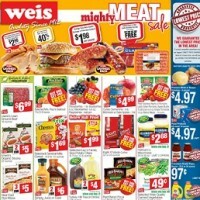 Weis faces significant competition from various food retail formats, including conventional retailers, mass merchant retailers, discount retailers, drug stores, convenience stores, and dollar stores. 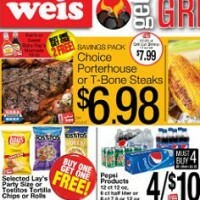 Weis’s chief competition comes in its traditional home base of central Pennsylvania. Giant (Carlisle), a supermarket chain owned by Ahold, began aggressive expansion during the 1990s, building newer, larger stores with vast selections. The expansion caught Weis off-guard. While Weis was able to kick into gear with an expansion project of its own, it has not yet fully recovered. Giant still remains the market leader throughout central and northeastern Pennsylvania. 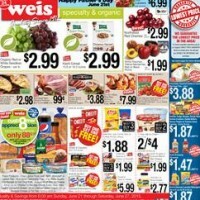 If you are interested in knowing more about the company, its statements, products, and special offers or discounts, please visit www.weismarkets.com. 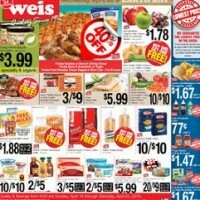 Latest Weis Markets circular, weekly ad and sales flyer. 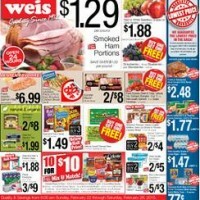 This week Weis circular and grocery ad coupons on iweeklyads.com.